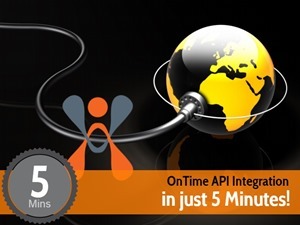 The OnTime API (Application Programming Interface) makes it possible to connect a live OnTime account with other software systems across the internet. The API can be used to create, update, and track orders in real-time. This API is made available as a set of SOAP based XML Web Services built on open standards. Our comprehensive documentation includes examples, descriptions, and explanations to help software developers integrate their solution quickly and easily. Our API is designed to work with virtually any programming environment and platform. Integration into your project can be accomplished within minutes, not days or weeks. Before you get started, download our OnTime Web Service API Documentation. Review the document and click on the video below to get started. If you need further instruction, please contact our customer support team at 541-326-4200 and press 2 to reach a support specialist. With OnTime, you can save time by automatically importing mass amounts of data from CSV and Excel files. To import data to your OnTime account, simply open the Data tab in OnTime Management Suite, click on the Import Data button, and map OnTime's fields to your file's corresponding columns. New subscribers to OnTime will find this feature especially useful while setting up an account. Older company data can be quickly brought into your OnTime account, without the need for manual entry. We provide import templates to help you to easily organize your data into a format that will work best with OnTime’s import data feature. Current OnTime subscribers often use this feature on a daily basis for a variety of different tasks. If your customers have many shipments that will need to be entered into your OnTime account ahead of time, they can be collected in bulk as an ASN (advanced shipment notice) and imported all at once and all information will be automatically included in your account. When importing information from customers who are in a different time zone than you, adjustments can be made to the dates and times during import. This way, OnTime automatically will rectify time zone differences between your customer and your company. When shipment information needs to be quickly referenced, you can avoid the necessity of typing in tracking numbers by using barcode scanning. Scanning a barcode will automatically prompt OnTime to reference an order with the matching tracking number. To make sure the barcode scanner can provide instant results, be sure to acquire an ASN (mentioned above) file from your customers. This file can be quickly imported into OnTime, ensuring that your barcode scanning runs smoothly starting with the first scan. If you need to create a large number of shipping labels for a customer based on a list of orders, OnTime can help you to do so quickly. Import the document that the customer has sent you into OnTime using the import data feature and select those orders from OnTime's Tracking View. Then, simply right-click and select the shipping label type that you require to print or email the labels for your customer automatically. The import data feature can help OnTime users to greatly improve their overall efficiency. Bypass the need for manual entry, quickly access your data at any time, and store your data on OnTime’s secure cloud. OnTime provides international customers with the tools and support that they need, anywhere in the world. As of August 2015, OnTime is successfully used as courier management software by active companies in 132 countries around the world. As a part of our international support, OnTime will use your local time zone, helping to avoid confusion or conflicts. This feature will help you to be sure that your company’s scheduling and records are always accurate. Regional localization support adapts to the user’s local setting and format for currency and dates. Without the need for manual adjustments, all information and records that you use with OnTime will be accurate and appropriate for you and your customers. OnTime is equipped with full Unicode support, meaning that you can use any language, including Arabic and Chinese. No matter what country or language your business operates in, OnTime can help you to improve your efficiency and manage your shipments. Technical support is included for every OnTime subscriber. If you ever encounter any difficulties, our expert support agents are available to assist. OnTime’s international support sets us apart from any competing software. With two years of research and development invested in OnTime’s international support and nearly 300 regions formally supported, you can be sure that OnTime will work for you, wherever you are. For more information about OnTime’s international availability and support, contact us now. In our last post, we discussed the customer service improvements that the OnTime Customer Web Portal offers. Along with the Web Portal, OnTime’s programs provide your employees with a number of useful tools that can help to quickly satisfy your customers’ needs. OnTime Dispatch allows users to track orders in real time. Your employees can offer this information to customers at their request, at anytime. From OnTime Mobile, your drivers can input up-to-date information about orders, such as order status. OnTime Dispatch users can message OnTime Mobile users through our programs, allowing for optimal communications. All of this information ensure that your collections and deliveries are assigned appropriately, handled properly, and completed on time. From OnTime Dispatch’s order entry screen, quick and accurate price quotations can be created at your customers’ request. These quotes can be saved to enter into the system later, improving order entry efficiency. Saved searches, called Quick Views, can also be created using our Advanced Search function to find orders and information anytime. When customers request such information, your employees will be able to fulfill those requests immediately. OnTime Management Suite gives your administrative users access to employee management tools. These tools can be used to ensure that customers are serviced at the right times, in the right places, and by the right people. Reports can be generated, printed, faxed, or emailed from your OnTime programs. If your customers ever require reference to detailed information, your employees can do so. Additionally, the Workflow Designer can be used to automate the sending of these reports, saving your employees’ valuable time. OnTime's programs and features can help your employees provide the best possible customer service. Which OnTime tools do you find most useful for managing and automating your customers’ satisfaction? Improve your customer service and satisfaction with OnTime's tools, such as the OnTime Customer Web Portal. Your company can make these improvements while saving time and resources by allowing customers to use your Customer Web Portal from any web browser. From the OnTime Customer Web Portal, your customers can submit their own orders into your OnTime account. Real-time information about their orders, such as status, assigned driver, delivery time, recipient signature, and more can be viewed from the Web Portal’s tracking screen. Order histories can be found here, as well. Customers may also generate their own shipping labels and other reports from your Web Portal. These reports can be exported to Microsoft Excel or printed, as desired. A personal address book is available to each of your customers from the OnTime Customer Web Portal. Each customer will only see the addresses that are associated with their account. Your dispatchers will be able to use OnTime Dispatch to view all addresses, for quick and easy order entry. Bulk addresses may be imported by your customers for quick address book population. If your customers ever need assistance with your Customer Web Portal, we offer a user guide that will help them understand and use the tools provided. Your OnTime Customer Web Portal, can be embedded into your company website and customized to match your brand and aesthetic, enhancing your customers’ online experience. The OnTime Customer Web Portal is included with Enterprise subscription plans and higher. Sign up for a trial account to test the Web Portal and its features now. If you are considering purchasing courier software, you are likely looking for help to automate and improve your business. Choosing the wrong courier software could cost your company more time and money. Depending on how your business operates, different features, applications, and functions will need to be considered to make the best courier software choice for you. Be sure to consider each of the factors below before making a purchase. The courier software that you purchase must be available and functional in your region. Additionally, if your business operates in areas with inconsistent internet connections, the software that you choose should have the ability to work online and offline. Software with a knowledgeable and experienced customer support staff will help you to setup and use your account quickly and easily. Find out what level of customer support your courier software provides to be sure that you will have the assistance that you need. The tools that your software offers to your employees and customers should be customizable to fit with your business’s operations and brand. Some software will allow you to change the appearance and style of reports, customer tools, and more. If your company operates in a different area than your courier software, you will want to check that currency, time zones, and measurements will be adjusted for your region. Who will need access to your account? The number of users and the type of users that will be accessing your account will affect your courier software choice. Be sure that the software that you choose can handle your company size and offers individual tools for your administrators, drivers, and dispatchers. Interdepartmental communications should be facilitated by your software, as well. Start-up costs and monthly costs should be considered when purchasing your courier software. Check that all the features and functions that you require are available at a price that suits you. Your company and customer information must be stored securely by your software provider. Find out how your courier software stores this information and be sure to check the software’s security history before purchasing. The courier software that you choose must keep up-to-date with the latest technologies available. At the same time, the software should not require you to make new hardware purchases to keep your company up-to-date with the level of technology. Compare OnTime’s applications, features, functionality, and cost with other courier software before you make your purchase. Your Billing Email Template is sent as the message for your emailed invoices, unbilled orders, and billing cycles. Special fields, which act as placeholders for information, can be included in both the subject line and the body of your Billing Email Template. 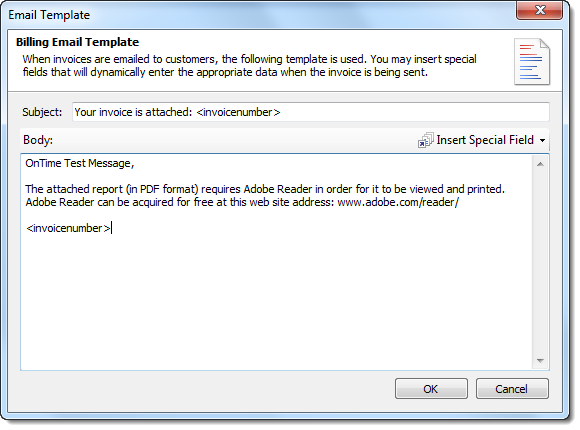 Invoice numbers can be included in your template as a special field, as well. 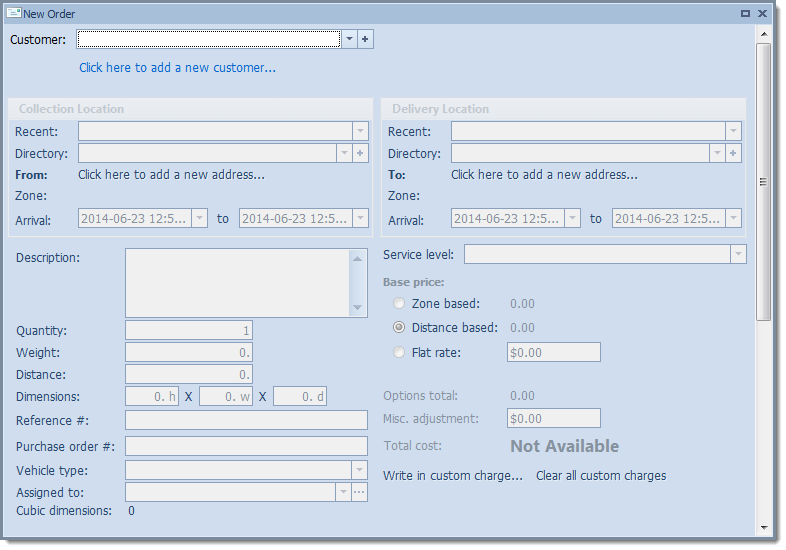 When you are sending unbilled orders or billing cycles and no Invoice Number is found, that special field will be return blank and nothing will be input into the message. The file naming format for your Billing Email Template’s attached files has been adjusted to be more logical. To find your Billing Email Template, navigate to General Options and click on Billing in OnTime Management Suite. Reports can be generated in bulk, in addition to individually. This is another example of an enhancement has been made at our users’ request. From the Billing area, multiple invoices can be faxed, emailed, or printed by simply selecting the invoices, right-clicking, and choosing the desired action. When you are printing multiple invoices, you will select the printer for the first invoice, and the rest will be sent to the same printer. To ensure security, sending multiple invoices will require that you confirm the recipient for each invoice. 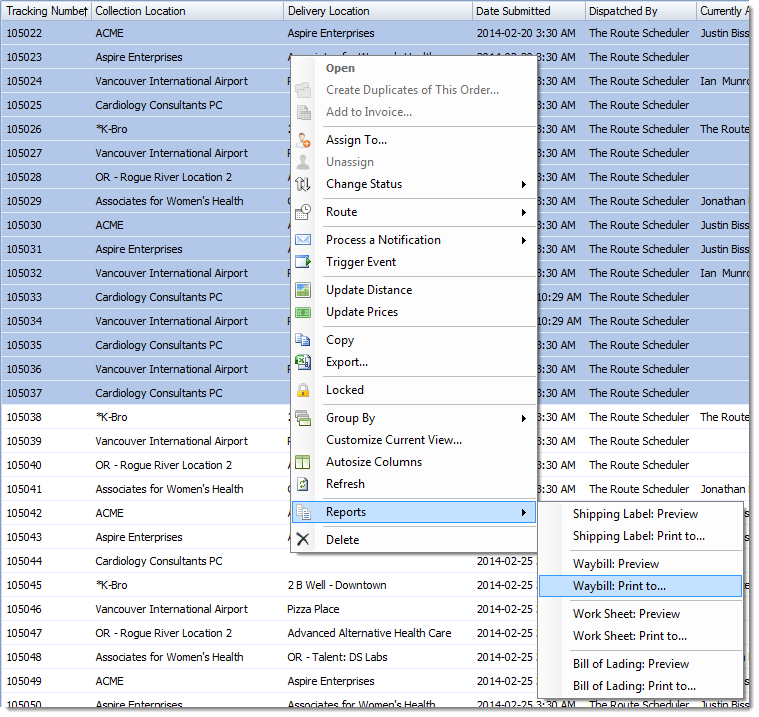 From the Tracking area in both OnTime Management Suite and OnTime Dispatch, reports can also be printed in bulk. These reports include Shipping Labels, Waybills, Work Sheets, and Bills of Lading. To print reports for multiple orders, select the desired orders, right-click, go to Reports, and choose the Print to option for the report type that you wish to print. In this update, the printing options in the Tracking area have been improved to allow you to select your desired printer at this point, as well. OnTime’s software and services are always evolving based on the needs of our users. We have released new tools for OnTime users to help speed introduction and setup processes. OnTime Introductory Courses and an OnTime Setup Checklist are now available to help you quickly work through your setup process. 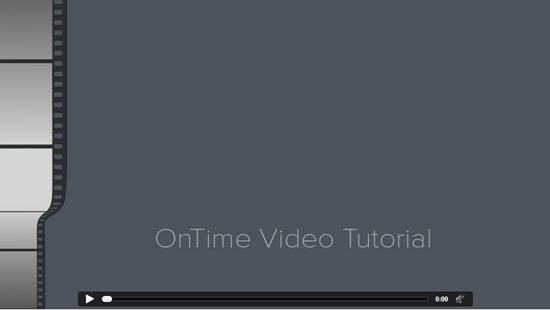 OnTime Introductory Courses are available to new OnTime subscribers. These courses have been tailored to introduce your subscription plan’s applications, features, and functionality. Each plan has a different Introductory Course Video available, based on what is important and available to users of that subscription level. You will find your OnTime Introductory Course link with your account information in the Welcome email sent to you after signup. 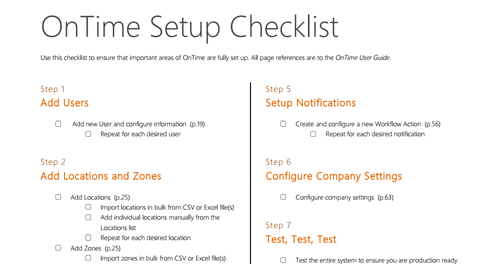 The OnTime Setup Checklist has been created to help new users work through the account setup chapter of the OnTime User Guide. The list has been designed to help you to determine which steps you need to complete to make your account work for you, and will help you to ensure that each of those steps is completed. References to page numbers have been included to help you locate each step quickly and easily. The OnTime Setup Checklist is available to view and download from the User Guide page on our website. To get started with your own OnTime account, sign up for a trial or subscribed account today. If you have any further questions regarding setup, let us know. The speed of your order entry impacts your delivery business’ overall efficiency. If an order is entered quickly, but incorrectly, the time that it takes to make those changes will likely negate the speed of order entry. To optimize your company's efficiency, you must have a fast and accurate order entry process. Below are six tips to help improve the speed and accuracy of your order entry process. Your ability to enter orders accurately and efficiently will depend on how well you know how to use the order entry interface. The more familiar that you become with the interface, the more intuitive that order entry will become. Practice using your interface to be sure that you fully understand how it works. With many interfaces, you will be able to use keyboard shortcuts and other features to minimize your keystrokes when entering orders. Thoroughly test and explore your interface to discover how you can maximize your speed. Will the order that you are entering need to be tracked? How will the customer be billed for the order? What kind of reports will need to be generated? Everything that can happen to the order in the future can be prepared for during order entry. The information that you input will likely be useful to your customers and other parts of your company. Be sure to keep track of all order information and communicate with other levels of your company to ensure that orders are entered, tracked, delivered, and billed properly. Courier software, such as OnTime, can help you to ensure that information is generated and available as your company and customers require. Invoicing, tracking, and other features can be accessed through multiple programs. With OnTime, most of your preparations can be made ahead of time. Orders may have special circumstances, or may require unexpected changes. For example, you may need to setup orders ahead of time, on offset schedules, or with unique information fields. If an order that you are entering has complex circumstances, you must be equipped to place the order and move forward, without lapses in accuracy or speed. Be sure that you know exactly how to handle any special order circumstances that your company may encounter. Know your company’s policy, understand your customer’s desires, and follow the other tips posted here to prepare for any possible scenario. If the system that you are currently using to enter orders is impeding your ability to be flexible, consider using OnTime or another courier software. Save orders for the future, generate price quotations, and adjust for virtually every special circumstance by utilizing the features available. If you prepare an order with inaccurate pricing, corrections will need to be made and issues may arise. Because those corrections will take up time and company resources, inaccurate pricing will often have a negative impact on your company’s efficiency. Pricing accuracy will also allow you to offer customers the correct prices for quotations and totals. During order entry, always consider the accuracy of an order’s price before you submit that order. Be sure to check that you are using the right pricing scenario and calculations for each order. With software such as OnTime, prepare accurate pricing by setting up your pricing scenarios and calculations ahead of time. These scenarios and calculations should be associated with the appropriate customers to guarantee accuracy during order entry. As with pricing, if the wrong order information is entered, corrections will need to be made. The time that it will take to make these corrections will adversely affect your company’s overall efficiency. Along with accurate pricing scenarios for that order, you will need to guarantee the correct customer, delivery location, pickup location, and more. Be sure to check all customer, location, and other order information before you submit the order. If you are using previously setup records in courier software, the information will likely be accurate. If new information must be input into your system during order entry, check that everything is entered correctly. Know where your drivers are and where they will be, so that you can give them order assignments that make sense geographically. Keep in contact with your drivers so that you can check with them about their location and other factors, as needed. Dispatcher and driver communication can benefit from the possibilities afforded by mobile devices and applications. OnTime Mobile works with OnTime Dispatch to relay driver information to dispatchers and to keep your drivers and dispatchers communicating.